On Sunday, May 6, the Winterthur Museum, Garden & Library will be hosting its 40th Annual Point-to-Point Steeplechase on the grounds outside the museum. This is one of the biggest and most exciting annual traditions here in Wilmington, and with this year being the 40th anniversary, we are expecting it to be the most outstanding event to date! Of course, in order to understand just how big of a deal the annual Winterthur Point-to-Point is, you need to have a little bit of background about the history of the Winterthur, as well as a basic understanding of horse racing. Let&apos;s see if we can&apos;t help you out with each of those here briefly. Winterthur is a museum, garden, and library located just about 20 minutes northwest of downtown Wilmington. The grounds were once the property and home of Henry Francis du Pont. Today, the 175-room mansion has been converted into a stunning museum and gallery that tell the story of what the property and the surrounding area was like when the du Pont family called it home. In addition, the gallery portion of Winterthur is home to the premier collection of American decorative arts with over 90,000 objects in its collection. The property also houses a massive library that has become one of the top reference libraries in the country for anyone researching America&apos;s artistic, cultural, social, and intellectual history from the colonial times up through the early 20th century. Where the museum and library are great for attracting history buffs, the 1,000 acres that make up the rest of the property offer the kind of stunning beauty that a much wider range of visitors will appreciate. With a 60-acre naturalistic garden, rolling hills, meadows, streams, forests, and ponds, Henry du Pont created a modern masterpiece that lives on today. 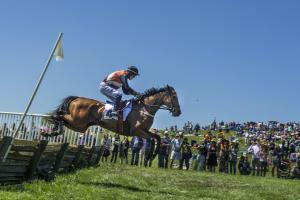 What is a Point-to-Point Steeplechase? To connect its rich history and beautiful gardens with a reason to stop by and visit, Winterthur started hosting an annual point-to-point steeplechase every spring. For those who don&apos;t have an equestrian background, a point-to-point steeplechase is the kind of horse race that includes hurdles for the horses to jump. Because this is an increasingly rare type of race today, it makes a perfect pairing with the rich history you will find most everywhere at Winterthur. But beyond the race itself, Point-to-Point is a festival within a festival as crowds gather in their finest spring fashions, prepare lavish and elegant tailgate luncheons, and watch the traditional antique horse-drawn carriage parade. There are also plenty of children’s activities, party tents and food for purchase for non-tailgaters. General admission tickets to the event are currently available online. These tickets include admission to all of the race day events, as well as remote parking. However, if you know anything about racing, you already know that tailgating is a significant part of the experience. Food Network host Skyler Bouchard will be working her way through the parking lot in search of the best tailgate party. If you are thinking about throwing your own party in the parking lot, make sure that you purchase tickets that will give you access to the designated tailgate area. No matter what type of admission you purchase, everyone will have access to a wide range of vendors and tents that will keep you entertained between races. Point-to-Point at Winterthur is a huge event here in Wilmington every year, but with this year being the 40th anniversary, we are expecting it to be one of the biggest and best events the Winterthur has ever hosted. Don&apos;t miss your chance to experience this classic American tradition here in Delaware!